By Citizens of the Enlightened (Blue) States of America. Reported from FB. We have had all we can take of your Neanderthal attitudes and politics and we’ve decided we’re leaving. 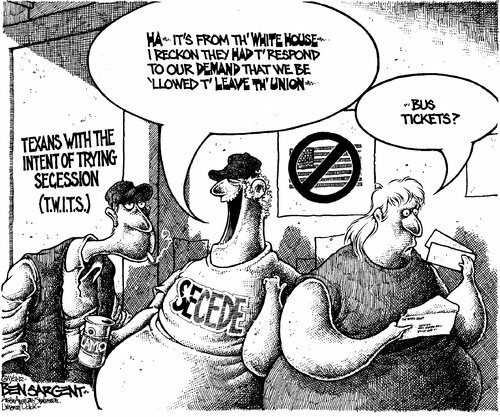 We intend to form our own country and we’re taking all the Blue States with us. In case you aren’t aware, that includes: California, Hawaii, Oregon, Washington, Minnesota, Wisconsin, Michigan, Illinois, Ohio and all of the Northeast. We believe this split will be beneficiall to the nation and especially to the people of the new country of The Enlightened States of America (E.S.A).To sum up briefly:You get Texas, Oklahoma and all the slave states.We get stem cell research and the best beaches.We get the Statue of Liberty and the Golden Gate Bridge. You get Opry Land and Branson, Missouri.We get Intel and Microsoft. You get WorldCom.We get Harvard and Stanford, You get Ole’ Miss.We get 85 percent of America’s venture capital and entrepreneurs. You get Alabama.We get two-thirds of the tax revenue. You get to make the red states pay their fair share.Since our aggregate divorce rate is 22 percent lower than the Christian Coalition’s, we get a bunch of happy families. You get more single moms.We will have firm control of 80% of the country’s fresh water, more than 90% of the pineapple and lettuce, 92% of the nation’s fresh fruit, 95% of America’s quality wines, 90% of all cheese, 90 percent of the high tech industry, most of the US low sulfur coal, all living redwoods, sequoias and condors, all the Ivy League schools plus the University of Wisconsin, San Diego State, Cal Poly SLO, Occidental, Cal Tech and MIT. mosquitoes, nearly 100% of the tornadoes, 90% of the hurricanes, virtually 100% of all televangelists, Rush Limbaugh, Fox News, Clemson and the University of Georgia. We get Yosemite, thank you. 38% of those in the Red states believe Jonah was actually swallowed by a whale, 62% believe life is sacred unless we’re discussing the death penalty or gun laws, 44% say that evolution is only a theory, 53% that Saddam was involved in 9/11 and 61% of you crazy bastards believe you are people with higher morals then those of us who actually use our brains. We’re taking the good weed too. You can have that crap they grow in Mexico.